A little time wasting goes a long way. Photo by Cleaver. No business can afford to have employees waste time or effort. No manager can expect employees to be 100% efficient either. Some time wasting activities can actually be rejuvenators according to an article on finding a productivity sweetspot by NICE Systems. It might not be surprising to learn that the 2012 Time Wasting Survey from salary.com found that men are greater time wasters online than women and that the worst offenders are men, 26-35. The justifications cited by employees range from the biggest reason: not challenged or long hours to the smallest reason: low pay. How is Wasting Time Beneficial? Research by games creator Jane McGonigal that appeared in the Harvard Business Review suggests wasting time builds resiliency. It can be good for us according to doctors, neuroscientists, and psychologists when it boosts us in one of four ways – physically, mentally, emotionally or socially. According to Cindy Krischer Goodman, blogger for the Miami Herald, engaging in some activities we label as nonproductive may actually be a smart way to spend time at work. They act as small exercises and can make people more resourceful problem solvers, more collaborative, and less likely to give up when the going gets tough. What’s the solution when too much time is wasted? Companies have tried banning access to social networking sites like Facebook and Linked in. Employees get around this by using their own personal devices. Can you reduce staff wasted time and gain an hour a day? 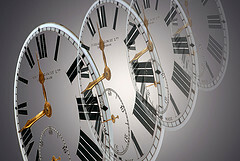 Experts in staffing say that limit wasting time to one hour would be optimal. You may not be able to easily address the issue of challenging work, but you can address long hours by making sure that the amount of wasted effort is reduced. There’s another way you can reduce wasted effort and reduce employee frustration: use checklists. It seems simple but they can be a real time saver when it comes to making sure nothing falls through the cracks, cross training, and efficiency. How can you get started? Read The Checklist Manifesto by Dr. Atul Gawande, M.D. The use of checklists has cut down on after surgery complications and reduced deaths in poor and rich hospitals where they are used. Astronauts use them to save lives as we see in the Sandra Bullock film Gravity. They keep employees focused on the task and the process of putting them together and using them highlights potential areas of improvement. Maybe the best thing about a checklist is that it’s innocuous and non-threatening. Checklists can be a little challenging to put together because it’s inevitable that those who do this task often will forget to write down an important step. The process brings people together and improves productivity when you have those who don’t normally do this work see if they can do it by following the checklist. Many great improvements have come out of this team work. Try it and see if you can accept a little wasted time and improve employee productivity!